"Production, Not Reproduction" is a blog written by Heather about her life as a mother of two children through domestic, open adoptions. Heather also organized a group of Open Adoption Bloggers, of which I am a member. 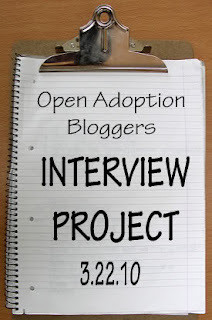 In order to commemorate the first anniversary of the Open Adoption Bloggers, members were voluntarily paired with others and asked to interview their partner. (To read those interviews and Heathr's blog, go to http://www.productionnotreproduction.com.) I had the pleasure of being paired with Thorn who, with her partner Lee, has been a foster parent to children in respite care. They have also hoped to become adoptive parents of a child in foster care, as Tim and I are. get older, we get along better. the outdoors and other things besides being passive consumers. than my parents were, but I do appreciate a lot of what they did. > as parents, if at all? conflicted about how I'll play a lot of the more stereotypically "mom"
because at this point that's a role that causes him too much stress. > have an open adoption? supportive connections can be a major plus. fantasy of what their dad must have been like. > 6. What if your child doesn't want to see their biological/first parent(s)? of creating our own story and life as a family. > 7. What would a child of your dreams be like? with a child, that I'll get to see a personality grow and flourish. > 8. Anything else that you want to tell people? And thanks, Michelle, for these great questions!